Developer Tips 'n' Tricks: DevTnT 2 - Create a Visual Studio Shortcut for "Open Containing Folder"
DevTnT 2 - Create a Visual Studio Shortcut for "Open Containing Folder"
Type in something into "Show commands containing" to get a list of matching commands. If there is already a shortcut for the selected command, it’ll be displayed in "Shortcuts for selected command". To assign a new shortcut to the selected command, put the cursor in "Press shortcut keys" and press the shortcut key or key combinations desired. E.g. 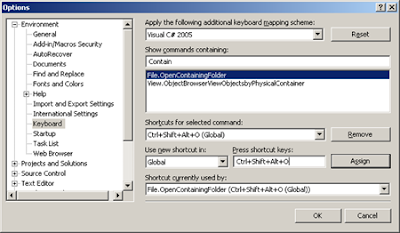 you can want to open the containing folder of the current file in Windows Explorer by pressing Ctrl+Shift+Alt+O?